Stordalen Mire study site. The biogeochemistry hut is connected to autochambers, allowing measurements of gas flux. 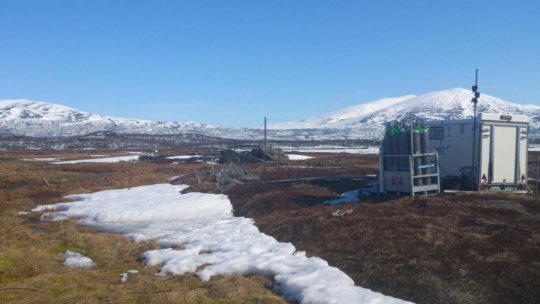 A University of Queensland-led international study could lead to more accurate predictions or the rate of global warming from greenhouse gas emissions produced by thawing permafrost in the next 100 years. The study of the microorganisms involved in permafrost carbon degradation links changing microbial communities and biogeochemistry to the rise of greenhouse gas emissions. It was led by Australian Centre for Ecogenomics researchers in the UQ School of Chemistry and Molecular Biosciences Dr Ben Woodcroft, PhD student Caitlin Singleton, Professor Gene Tyson and international colleagues. "As global temperatures rise, large amounts of carbon sequestered in perennially frozen permafrost are becoming available for microbial degradation," Dr Woodcroft said. "Until now, accurate prediction of greenhouse gas emissions produced from thawing permafrost has been limited by our understanding of permafrost microbial communities and their carbon metabolisms." Using sequencing techniques pioneered by Professor Tyson, over 200 samples from intact, thawing and thawed permafrost sites in northern Sweden were examined. DNA sequences of more than 1500 microbial genomes all new to science and involved in complex biochemical networks were recovered. IThe research, which included new metagenomics software run on UQ supercomputers, also implicated a number of these entirely new lineages in the production of greenhouse gases. Ms Singleton said permafrost stores around 50 per cent of the total global soil carbon (or 1580 billion tonnes). "The Intergovernmental Panel on Climate Change report estimated that between 30 and 99 per cent of near-surface permafrost could disappear by 2100," she said. "Northern permafrost wetlands contribute a significant portion of global methane emissions, particularly as collapsing permafrost can create the perfect anaerobic conditions for methane-producing microorganisms (methanogens), and their metabolic partners, to thrive.